It's November already! I can't believe it's so late in the year! My first thought was, 'This time next month I will be opening up my Advent-Calendar' - which feels too soon! I'm really excited for a lot of happenings in November, not mentioning the fact we are down to only twenty days for Catching Fire! My October was great! It involved two book festivals where, I met up with Lucy from Queen of Contemporary and author, Siobhan Curham for her event at Bath Literature Festival! I also went to a talk with Sarah J. Maas, Maureen Johnson and David Levithan which was hilarious at Cheltenham Festival! I attempted to Vlog it, as I was going to both festivals in one-weekend(which was very tiring) but, I decided I would keep to blogging! I think you need a certain level of confidence to Vlog and put yourself out there, and it's quite known that I like to hide behind a book. Although, just trying it out was something I'm happy I did in October! I've been wanting to attempt Vlogging for a few months now so, it was interesting to have a go at it! I didn't get any strange looks when I was filming the middle of the street and, at that, I was quite surprised! Over the course of the weekend, I lived on Costa Coffee and sandwiches from Waitrose. I did a POSTwhere I talked more about what happened at the events and what was said in the talks, including the discussion people's opinions of YA and how they seem to dismiss it. Also at Cheltenham, Twilight was something that the authors said a lot about, especially how it brought so many readers into this genre and that it shouldn't receive as much criticism as it does. This got me thinking a lot about what was said, and prompted me to write a post earlier this month called, "I Hate Twilight." I had a conversation with Sarah at the signing after the event and may have been a little bit excitable because of that! We spoke about Fleetfoot and how she can't possible kill him off because it will break my heart, how many tears were shed during Crown of Midnight and how Celaena relates to teenage girls when, of course, none of us are Assassins. She did let me into a secret though; that she is, in fact, as an assassin herself! Halloween was also in October! This involved me going out dressed as a Gothic-Vampire in the same cloak I wear every-year and putting on some black eye-shadow and lipstick. It soon began rainy, just as I left a friends house with both her brother and my younger sister. The problem with going Trick or Treating with children younger than you is that they tend to get more sweets! I just hide a load of our own sweets so, they are there for whenever I'm craving chocolate! It's half-term at the moment so, I've had extra-reading time! Although, that's also meant a huge amount of revision! On the first day of the holidays I had a text from the school reminding me of a Biology Test I will need to revise for! I've also had an English GCSE Speech to prepare for and an English CAT...it's all been pretty busy! My book of the month is a draw between 'Finding Your Inner Cherokee' and 'Every Day!' Finding Your Inner Cherokee was a breath of fresh air for me, and something that I loved because of how interactive it was. As it was an e-Short(and my review is featured in the final copy - out November 18th!) I decided to choose my favourite full-length book which was 'Every Day' because the writing was full of wisdom and I adored the idea! I hope you all had a great October and are enjoying the short-break from school! What are you most looking forward to in November? Sounds like you had a super fun October Sophie! 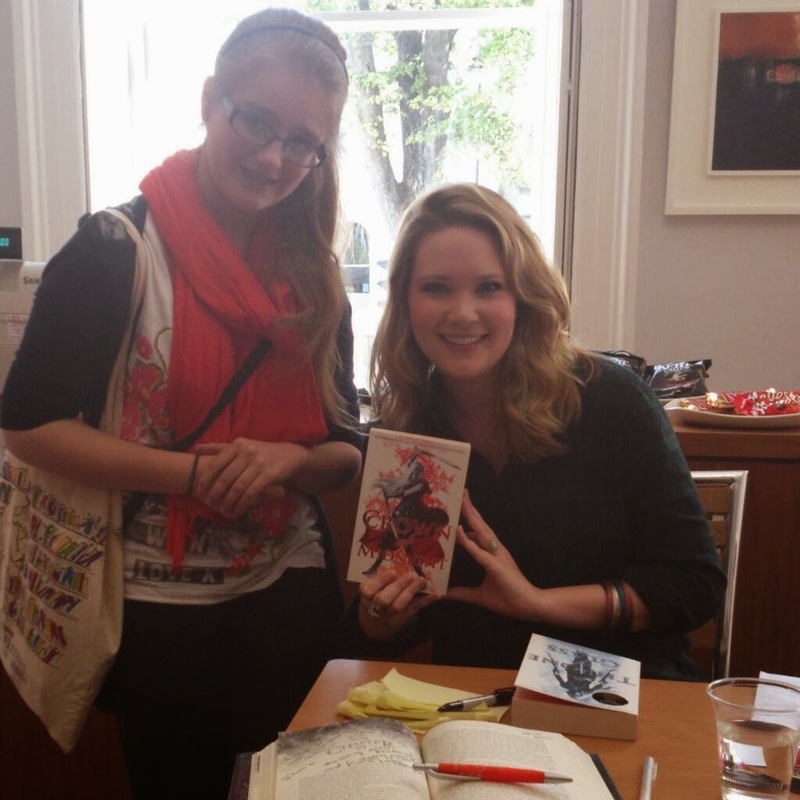 I am still so jealous that you got to meet so many awesome authors, especially Sarah J Maas. Siobhan was kind enough to send me a e-copy of Finding Your Inner Cherokee and I'm really excited to read it. Hope you have a even better November and CAN YOU BELIEVE IT CATCHING FIRE IS SO SOON, YET SO FAR AWAY!! I really wish there was some sort of book festival near me. It looks like you had lots of fun!